Forum Index > Makers and Manufacturers Talk > some recent work. Posted: Mon 25 Apr, 2016 6:06 am Post subject: some recent work. A couple of new pieces I finished recently. 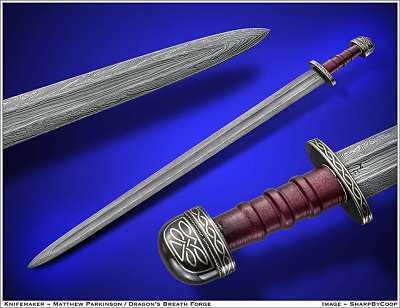 A custom viking sword 5 bar blade with steel fittings inlayed in fine silver. A falchion 5 bar blade patternweled fittings with Carnelians set in silver. Hi Matthew, that falchion is pretty intense! Cool stuff. I like that dirk, some nice details there on the grip. Glad to see your work.